BETTER PRODUCTION MMS JULY 2018 112 mmsonline.com GE AR PRODUCTION work. Job lot sizes may be lower, but part toler- ances are tighter than ever, and cell change- overs now happen daily. 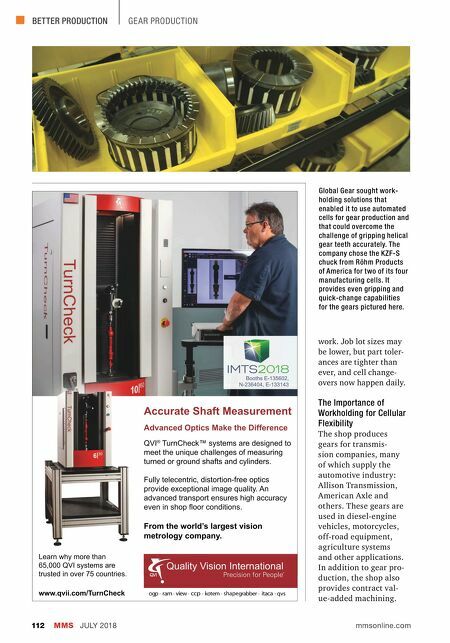 The Importance of Workholding for Cellular Flexibility The shop produces gears for transmis- sion companies, many of which supply the automotive industry: Allison Transmission, American Axle and others. These gears are used in diesel-engine vehicles, motorcycles, off-road equipment, agriculture systems and other applications. In addition to gear pro- duction, the shop also provides contract val- ue-added machining. 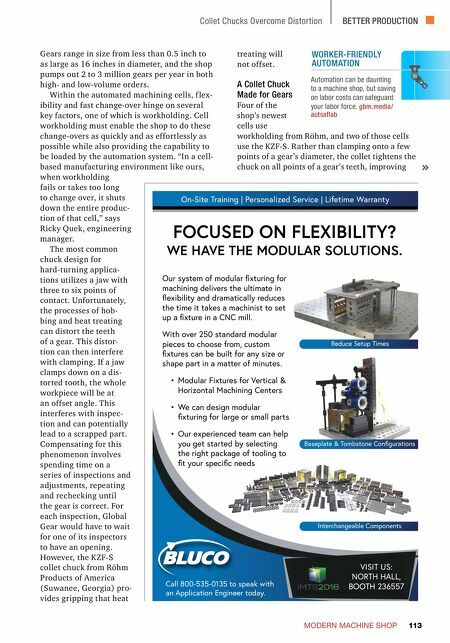 Global Gear sought work- holding solutions that enabled it to use automated cells for gear production and that could overcome the challenge of gripping helical gear teeth accurately. The company chose the KZF-S chuck from Röhm Products of America for two of its four manufacturing cells. It provides even gripping and quick-change capabilities for the gears pictured here.